The conference featured a rich a varied programme of keynote presentations, workshops, panel discussions and social events across the VWBPE regions, with a highlight of the conference for for many Second Life users being an open Q&A session with Linden Lab CEO Ebbe Altberg (transcript and audio available here). Following the conference, the Journal of Virtual Studies complies, edits and publishes a special edition featuring the proceedings of the VWBPE conference, and on Saturday, April 9th, Rockcliffe University announced the 2016 edition is now available. At just over 100 pages, the proceedings include peer-reviewed papers, along with those from the Quadrivium sessions, featured speakers at the conference, together with summaries of the topics presented during the general sessions, and a special feature paper by Dr. Karl Kapp about using virtual worlds for instruction. The journal is available for reading on-line via the link above, and the PDF file can be downloaded using the same link. In addition to the journal, the full set of video recordings from the 2016 conference are also available on a dedicated YouTube playlist, allowing those who missed the conference or who wish to revisit specific presentations / discussions to catch up with them. The 10th Virtual Worlds Best Practices in Education conference will take place between Wednesday, March 29th, 2017 and Saturday, April 1st, 2017 inclusive, with the theme of Legacy and an invitation for attendees to “Play * Explore * Engage * Immerse * Learn”. The 2016 Virtual Worlds Best Practice in Education (VWBPE) Conference launches at 11:00am SLT on Wednesday, March 9th and will be taking place in both Second Life and AvaCon Grid. 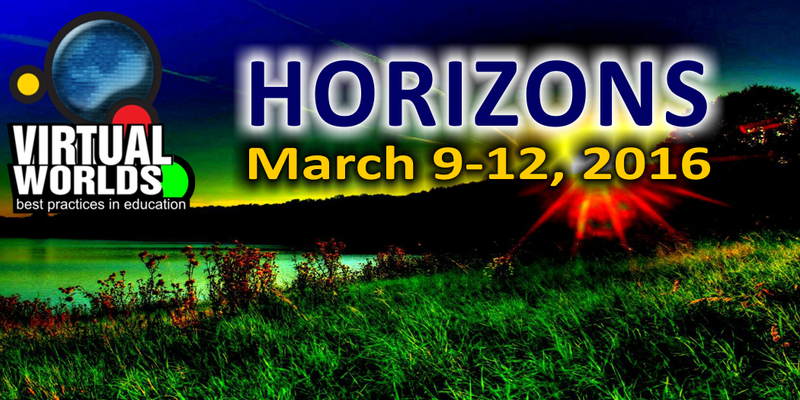 The theme for this year’s event is Horizons, and will include a presentations by keynote and featured speakers, panel discussions, workshops, social events and more, running through until the conference closes on Saturday, March 12th. Full details on conference events can be found on the VWBPE conference calendar. However, for ease-of-reference, here’s a quick run-down of some of the key events and activities. As always, all times are SLT. 17:00 – 17:50: Keynote address – Signalling a New Reality with Bronwyn Stuckey – at some of the signals in the past year of a blurring of what is virtual and what is physical, and how it is increasingly making any differentiation between the two redundant, challenging many of the assumptions we hold about the place of our work in virtual worlds. 18:00 – 19:00: Grid Watch with Ebbe Altberg – Linden Lab’s CEO will discuss issues of importance to the Second Life communities with a focus on listening to SL residence and responding to questions. Location: hop://grid.avacon.org:8002/Rockcliffe Library/25/26/78 (copy and paste link in-world on AvaCon grid). 08:00 – 09:50: Nonprofit Commons: Creating Impact Through a Community of Practice – a panel discussion on the role and focus of Nonprofit Commons (NPC), which was designed to create a community of practice for non-profit professionals, librarians, and social good focused technologists to explore and learn about virtual worlds such as Second Life. 19:00 – 20:00: ART presents North of Boston – the Avatar Repertory Theatre presents a dramatisation of Robert Frost’s 1915 modernist masterpiece live in voice. The VWBPE conference is free to attend, although there are donation options available for those wishing to support the conference. Those wishing to attend all of the conference activities across the four days of the conference will need accounts for both Second Life and AvaCon grid – please refer to Accessing the Conference for further details. The 9th annual Virtual Worlds Best Practice in Education (VWBPE) conference will take place between Wednesday, March 9th, 2016 and Saturday, March 12th, 2016 inclusive. A global grass-roots community event focusing on education in immersive virtual environments which attracts 2200-3500 educational professionals from around the world each year. Bronwyn Stuckey has been engaged in educational community and games in learning development for the past 15 years. She has worked to explore virtual worlds, games in learning and how we can cultivate identity, agency, citizenship, leadership, and community for students and teachers. Since leaving lecturing and learning design in the higher education sector her research, consultation and design have been in gamification and game-inspired designs for classroom contexts and professional learning and communities of practice. She is a current post-doctoral research fellow of the Arizona State University Centre for Games & Impact and independently consults to global groups like Intel and Microsoft programs and education communities. 18:00 – Grid Watch with Ebbe: Ebbe Altberg, Linden Lab CEO, will discuss issues of importance to the Second Life communities. His primary aim for the session, however, is to listen to Second Life residents and respond to questions. 14:00 – OpenSimulator Featured Panel: Cynthia Calongne, Selby Evans, Stephen Gasior and Maria Korolev engage in a discussion on the different perspectives of people who use OpenSimulator as an alternative, or in addition to, Second Life. This will be a thoughtful discussion on dedication, awareness, perception, and opportunity of the various communities of OpenSimulator. 17:00 – Virtual Worlds on the Go with Stephen Downes: In this presentation Stephen Downes examines the intersection of learning, performance support, and mobile virtual worlds and simulations and discusses the real world applications for this technology, describing a variety of learning scenarios, and background and infrastructure needed to support such a system. Additionally, he examines the role of educators and content publishers, identifying the need for institutions to provide learning support and scaffolding to draw out the benefits of what might be called virtual worlds on the go. Stephen Downes is a specialist in on-line learning technology and new media. He speaks from practical experience both as a college and university teacher and the author of learning management and content syndication software. He has developed and deployed a series of progressively more innovative technologies, beginning with multi-user domains (MUDs) in the 1990s, open on-line communities in the 2000s, and personal learning environments in the 2010s. As a teacher and designer, he is also known as the originator of the Massive Open On-line Course (MOOC). 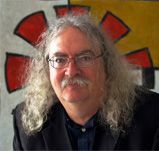 As a theorist, he is known as a leading proponent of connectivism, a theory describing how people know and learn using network processes. He has published hundreds of articles on-line and in print and has presented around the world to academic conferences in dozens of countries on five continents. 13:00 – Reaching the Engagement Horizon in Virtual Worlds: Crafting Engagement Through Games and Gamification with Karl Kapp: The use of games for learning seems like a good match, but we can’t blindly take it for granted. Instead, we need to explore questions to make sure the intuitive link between games, gamification and virtual worlds reaches its full potential. In this keynote, we’ll answer questions like: How does one mix virtual world and game-based learning experiences? How should games be integrated into a curriculum? Can attitudes and behaviour change result from playing a game in a virtual world? What elements of games can learning designers borrow from game designers? Can flying around as a superhero in a virtual world make you a nicer person? Discover evidence-based techniques for increasing on-line engagement, interactivity and, most importantly, learning. Karl Kapp, Ed.D., is a full-professor of Instructional Technology at Bloomsburg University in Bloomsburg, PA. 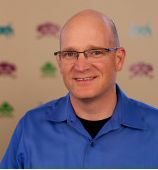 He teaches subjects related to games, gamification and learning technologies, and is also the director of Bloomsburg’s Institute for Interactive Technologies, working with organisations to create interactive instruction including games and simulations, co-founder of educational game company 2Klearning.com and founder of The Wisdom Learning Group. He has authored or co-authored six books, and served as a Co-Principle Investigator on two National Science Foundation (NSF) grants related to games and simulations and serves as an external evaluator on a third game-related NSF grant. 18:00 – Closing Ceremony and Thinkerer Award Winner Annoucement: closing remarks from Phelan Corrimal and other VWBPE Committee Chairs, the opportunity to learn about VWBPE 2017 and hear the 2016 Thinkerer Award recipient announced. Those wishing to attend VWBPE 2016 are strongly encouraged by the organisers to register (free of charge or donations towards costs accepted). Passport to the Metaverse offers the opportunity to explore nine interactive and engaging locations on the Horizons of teaching and learning. Opening of Sunday, February 28th, and running through to Sunday, March 20th inclusive (but exclusive of the conference dates), details on these experiences can be found on the VWBPE website and in the conference programme. The 9th annual Virtual Worlds Best Practice in Education (VWBPE) conference is scheduled to take place from Wednesday, March 9th, 2016 through Saturday, March 12th, 2016 inclusive – but deadlines are fast approaching for those still wishing to to submit a proposal for a presentation. VWBPE is a global grass-roots community event focusing on education in immersive virtual environments which attracts 2200-3500 educational professionals from around the world each year. Events take place in both Second Life and OpenSimulator. Educators and communities of practice who use virtual worlds are trend setters–pioneers in a virtual landscape of possibilities. To you, the next horizon is the next opportunity for change, for innovation, and for exploration. It is the next opportunity to offer a paradigm shift, and to chart unexplored lands for the newcomers, the intrepid following in your footsteps, and the curious seeking to find new opportunities and new ways of thinking. This year there will only be one call, and only one call, for proposals, so get them in by no later than January 17, 2016. This is a hard, no-extensions, deadline. Don’t get left out! The call for proposals in the academic and communities of practice categories ends Sunday, January 17th, 2016. The call for creative categories – exhibits and machinima ends Sunday, January 31st, 2016. Take advantage of the extended machinima deadline to submit your artistic vision and inspire participants! The Thinkerer is presented on the basis of lifetime achievement, rather than for a single contribution, to an individual whose deeds and actions have shown consistent selfless service towards the promotion of learning, community, and educational practices, and who exemplifies the spirit of cooperative development within immersive environments. Those wishing to nominate someone they believe deserves to be recognised for their contribution to the field of education and immersive environments should review and complete the nomination criteria and submission form. All nominations should be received by Sunday, February 7th, 2016. The final selection of the award recipient will be conducted by the VWBPE Organizational Committee by Sunday February 21st, 2016 and will be announced publicly during the conference closing ceremonies on Saturday, March 12th, 2016. The 9th annual Virtual Worlds Best Practice in Education (VWBPE) conference was recently announced, together with a call for proposals. Scheduled to take place between Wednesday, March 9th, 2016 and Saturday, March 12th, 2016 inclusive, VWBPE is a global grass-roots community event focusing on education in immersive virtual environments which attracts 2200-3500 educational professionals from around the world each year. The full Call for Proposals guidelines can be found on the VWBPE website, and as noted above, the deadline for submissions is Sunday, January 17th, 2016. In addition, on Saturday, November 7th the VWBPE organisers announced the opening of nominations for the 2016 Thinkerer Award. 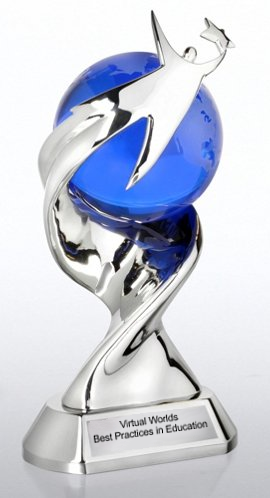 The award is for lifetime achievement rather than for a single contribution, and is presented to an individual whose deeds and actions have shown consistent selfless service towards the promotion of learning, community, and educational practices, and who exemplifies the spirit of cooperative development within immersive environments.